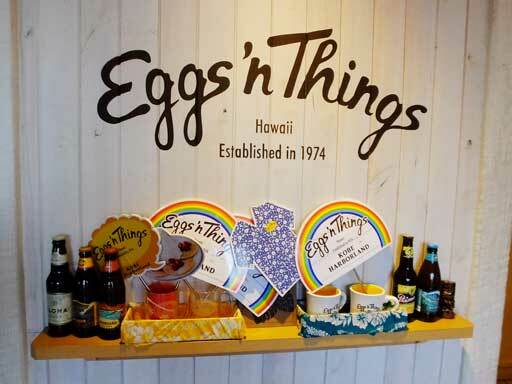 Most young Japanese women know the name of the Hawaiian restaurant chain, Eggs ‘n Things. 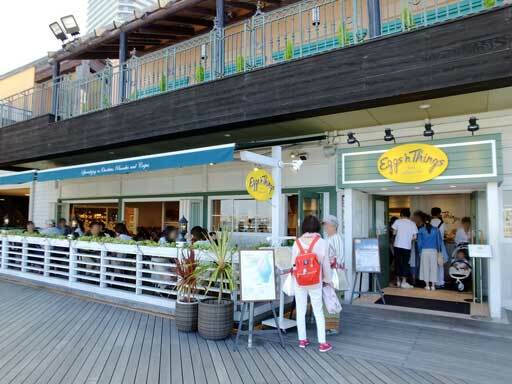 In 2010, Eggs ‘n Things opened in Harajuku (in Tokyo) as the first overseas store. Since then it has been more and more popular, and now (in June, 2017) it has 18 stores in Japan. 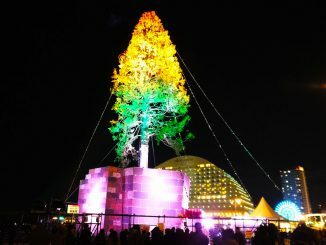 I went to the one in Kobe Harborland the other day. 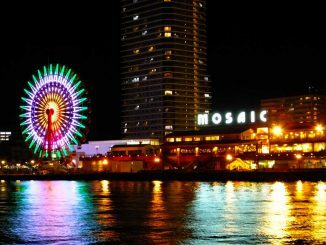 It is located in Umie Mosaic, a shopping complex alongside the sea, which I think is a good location for the Hawaiian restaurant. At the terrace, you can enjoy good food feeling the sea breeze. 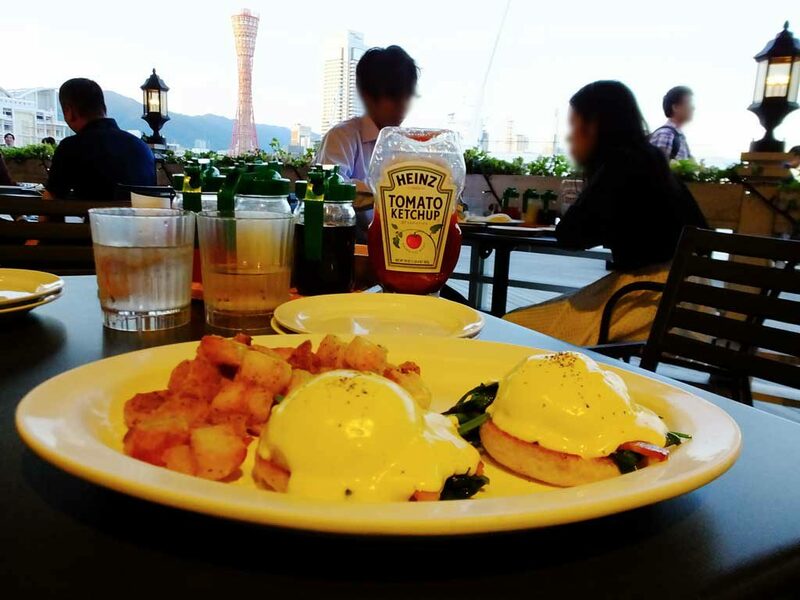 The restaurant’s concept is ‘All Day Breakfast’, and you can enjoy the breakfast menu all day. I ordered eggs benedict with spinach and bacon. It was 1,280 yen. I thought it was a bit expensive but delicious! The Hollandaise sauce was amazing, and the spinach and bacon went well with the sauce and eggs. 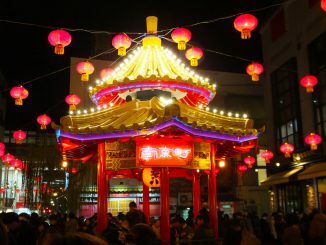 By the way, can you see the red tower in the picture? It is Kobe Port Tower. The location is great as well as the food. I also ordered pancakes, and shared them with my husband. This is the only store that has pudding pancakes on the menu among many Eggs ‘n Things stores. The pancakes are covered with custard cream with caramel sauce, and you can add three kinds of sauce on the table (maple, coconut and guava) as you like. I didn’t think twice about ordering them. They were 1,350 yen. They were light and not too sweet. Pancakes are must-eat because Eggs ‘n Things has been famous for them. 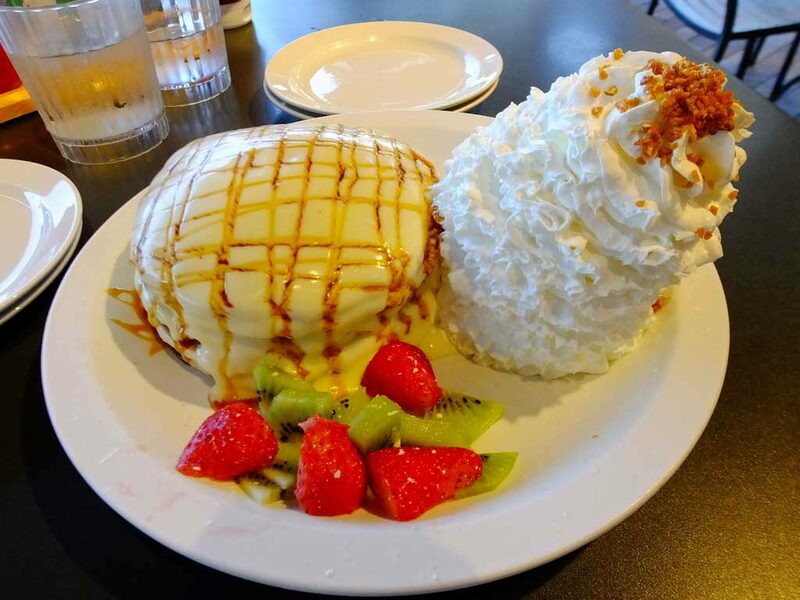 Eggs ‘n Things has an Aloha spirit, so the service is great. The staff are friendly, and they have English menus, too. I recommend this excellent eatery by all means. Also you can enjoy cocktail, beer and wine after 5:00 p.m. Drinking in the Hawaiian mood must be fun. The sweet Hawaiian music will melt your heart, too.